Cuteness alert - Baby Tassie devils! The pitter-patter of adorable little feet are setting hearts ablaze amongst the staff at The Australian Reptile Park. Tasmanian devil joeys are some of the cutest babies in the animal kingdom and these cuties are no exception. Tasmanian devils give birth to 30 minuscule joeys, but only the first four that attach to a teat will endure, so it’s survival of the fittest from the minute they are born. These joeys are now six months old, and visitors to The Australian Reptile Park will be able to see them in the September/October school holidays (2016). 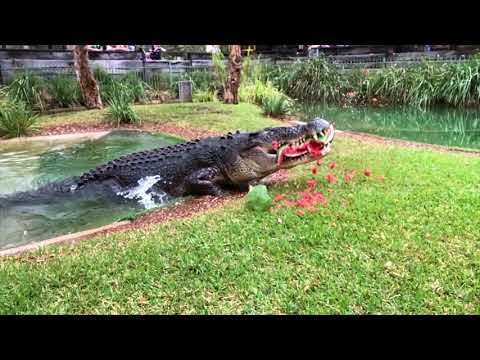 The Australian Reptile Park and Devil Ark are a part of a national breeding program to save the species from extinction. The Australian Reptile Park’s charity organization Devil Ark remains the most successful captive breeding facility for the endangered Tasmanian devil on the mainland – starting out in 2011 with 44 founder animals, the facility now holds an impressive 52% of the mainland insurance population at 154 animals. Currently classified as endangered*, *the Tasmanian devil is under threat from a transmissible cancer called Devil Facial Tumour Disease (DFTD). In Tasmania, the disease has reduced the wild population to less than 90% in some areas. DFTD continues to menace the endangered Tasmanian devil population. With still no cure or vaccine in sight and a continuing population decline, insurance programs like Devil Ark continue to be the species’ best hope of long term survival. Benefits of mixed species exhibits BRAND NEW dingo walks at The Australian Reptile Park!